Papa Bear invites you to come relax in this beautiful riverfront log cabin, with all the right amenities and a view second to none. Located near the beautiful Skyline Drive and Ski Slopes. Explore the famous Luray Caverns or take a short drive to the home of Thomas Jefferson. Maybe just relax, or fish or read a good book. This cabin will certainly create memories for a lifetime. 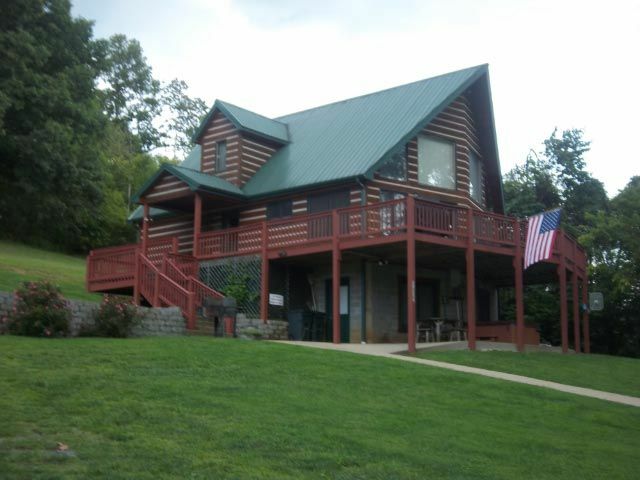 Papa Bear's River Cabin is family owned and built by Mr. Ron Hensley and son Tony Hensley. The Shenandoah Valley is a beautiful place and we love to share the area's natural beauty with our guest. Whether you are looking for the perfect place to go fishing , or simply to enjoy the peaceful view of the Shenandoah River and the awesome views of the surrounding mountains , you will fall in love with Papa Bear's River Cabin !! Both baths have tub w/ showers.Towels and wash cloths provided. Just footsteps to the Shenandoah River. The cabin is nicely equipped. The cabin is secluded by being surrounded by 280 ac of privately owned mountain land with beautiful river frontage but within easy driving distance to the town of Shenandoah and Luray. . Hot Tub ! Relax in this 6 person hot tub and watch the Shenandoah River drift by. Outdoor fire pit to roast hot dogs or make some yummy roasted marshmallows !! Firewood is provided !!! Would definitely stay here again. All the comforts of home with great privacy and a beautiful view. Papa Bear's cabin is a great getaway to enjoy the mountains, the river, the cabin, and those you are there with. Always enjoy my stay and its gets better every time! Think you for your kind words and taking time to review Papa Bear's River Cabin. We love having guest like you !!! We will always welcome you to stay at the cabin !!!! It is our pleasure to have wonderful guest like all of you . We are so glad you enjoyed your stay and hope you will visit us again. Thank you so much for taking time to review Papa Bear's River Cabin , we appreciate you !!! We had such a wonderful time at Papa Bear’s Cabin. Thoroughly enjoyed the beautiful scenery and coziness here! Will definitely be coming back in the spring/summer. Thank you so much! Thank you so much for taking time to review Papa Bear's River Cabin , we appreciate it. We are glad to hear you enjoyed your stay .Please know , you are always welcome here . We love having guest like you !!!! Hi Carol , Doug and Family , Thank you for your kind words and taking time to review Papa Bear's River Cabin. We are so glad all of you had a good time and hope you will come back again ..... Papa Bear loves guest like all of you !!! We had a great time at the cabin. Had a small problem with the dishwasher and owners were ready to correct it the next day! We washed the dishes and let them come and fix when we left. WHAT GREAT OWNERS! Thanks Ron and Bonnie for letting us visit your cabin. We love having guest like all of you visit our cabin !!! Thank you so much for your kind words . Please know , you are always welcome at Papa Bear's River Cabin . Hope to see you soon !!! Located in Virginia's Shenandoah Valley. Ideal location for couple's anniversary, honeymoon, quick getaway, family vacation or retreat. Enjoy being nestled between the Shenandoah National Park's Skyline Drive, The George Washington National Forest and the legendary Shenandoah River. Beautiful views and peaceful surroundings that nature has to offer. 1 Mountain + 1 River = A Perfect Vacation at Papa Bear's River Cabin. Also this property is near by Luray, Virginia.